GNE myopathy (MIM 600737) is an autosomal recessive muscle disease caused by mutations in the UDP-N-acetylglucosamine 2-epimerase/N-acetylmannosamine kinase (GNE) gene. Besides the typical phenotype, characterized by the initial involvement of the distal leg muscles that eventually spreads proximally with sparing of the quadriceps, uncommon presentations with a non-canonical clinical phenotype, unusual muscle biopsy findings or both are increasingly recognized. The aim of our study was to characterize the imaging pattern of pelvic and lower limb muscles in GNE myopathy, thus providing additional diagnostic clues useful in the identification of patients with atypical features. We retrospectively evaluated muscle MRI and CT scans of a cohort of 13 patients heterogeneous for GNE mutations and degree of clinical severity. We found that severe involvement of the biceps femoris short head and, to a lesser extent, of the gluteus minimus, tibialis anterior, extensor hallucis and digitorum longus, soleus and gastrocnemius medialis was consistently present even in patients with early or atypical disease. The vastus lateralis, not the entire quadriceps, was the only muscle spared in advanced stages, while the rectus femoris, vastus intermedius and medialis showed variable signs of fatty replacement. Younger patients showed hyperintensities on T2-weighted sequences in muscles with a normal or, more often, abnormal T1-weighted signal. Our results define a pattern of muscle involvement that appears peculiar to GNE myopathy. 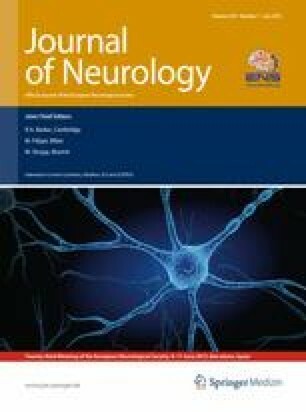 Although these findings need to be further validated in a larger cohort, we believe that the recognition of this pattern may be instrumental in the initial clinical assessment of patients with possible GNE myopathy. The online version of this article (doi: 10.1007/s00415-011-6357-6) contains supplementary material, which is available to authorized users. This study was supported by grants from the Catholic University and the Don Carlo Gnocchi Onlus Foundation to M.M. and A.B.